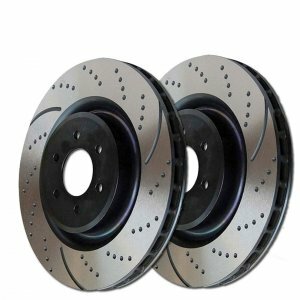 EBC Sport RotorsEBC Sport Rotors have precision bored dimples that help vent hot gases cause by breaking and also aid in the prevention of dreaded brake fade. EBC Sport Rotors precision bored dimples also help with brake rotor integrity they are resistant to cracking unlike many cross-drilled rotors that are prone to cracking under intense braking. EBC Sport Rotors are also gold or black anodized zinc coated for exceptional rust and corrosion protection which will keep your brake rotors looking great.